With a bird cage in the living room admittedly the reason I have seed moths in my living room is directly related to my African Grey Parrot. With a 50+ year lifetime I needed to find a solution to get rid of moths for good. The only flying creatures I want in my house are my birds! 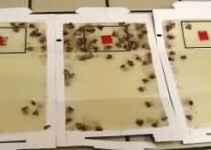 So after a good deal of research, I discovered that most pantry pest moth traps work on any type of food moth, including those that eat bird seed. Looking around the best price with the highest satisfaction reviews seemed to be cleanertoday.com. 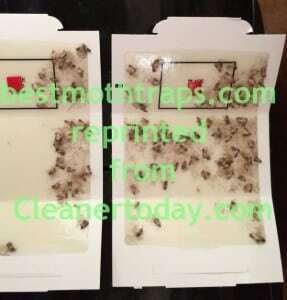 So I purchased 8 moth traps from them. I ordered on Monday morning and some how they arrived on Wednesday! Dried Fruit bird food came with moths.. . 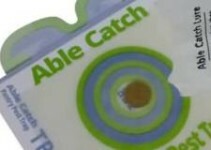 The instructions indicated to place the traps near the source of food, but after looking at the FAQs I found that with bird cages the preferred location is to hang the trap near the bird cage. So I put 1 trap under the cage, and a second trap on the other side of the room where I keep bird food. Great traps, loved the price and quick shipping. 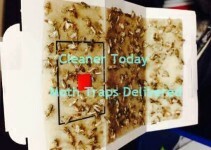 Moths caught in Moth Traps – Just One Night!